In mid-August 2018, deadly blazes across the western United States and Canada continued to destroy structures and disrupt the lives of millions of people. But you did not have to be close to the fires to witness its effects. 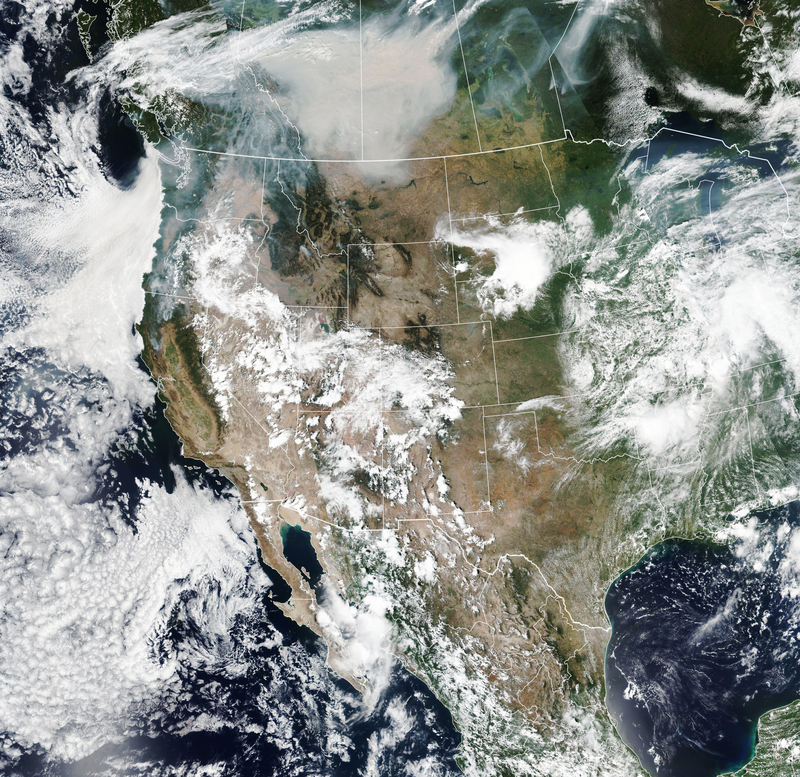 These images show just how far across North America winds have carried the thick plumes of smoke. 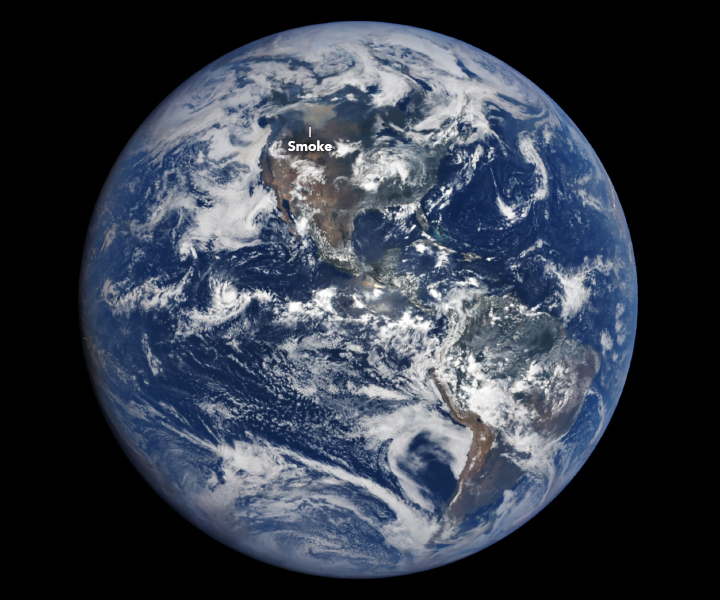 The Visible Infrared Imaging Radiometer Suite (VIIRS) on the Suomi NPP satellite acquired this image (top) on August 15, 2018. 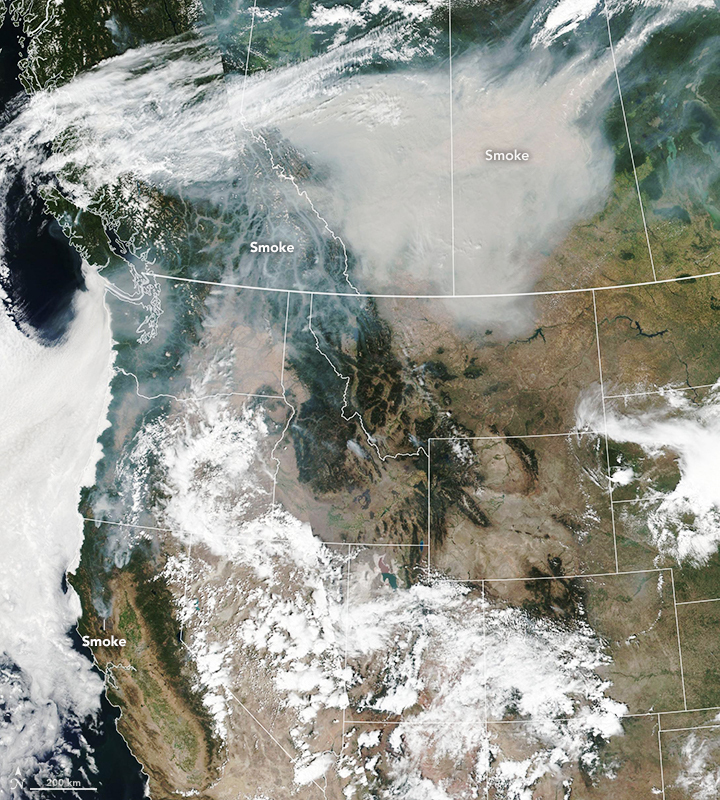 Smoke is seen hovering over much of western North America and central Canada. Wildfires also can produce black carbon pollution. This sooty black material comes from the incomplete combustion of fossil fuels and vegetation, and it is easily transported by winds. Black carbon can cause respiratory and cardiovascular problems if inhaled, and it can also affect climate. 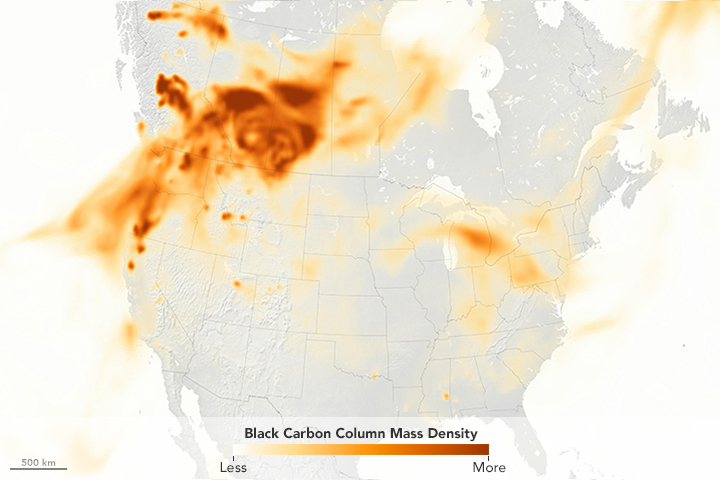 The map above shows plumes of black carbon associated with the western wildfires on August 15. Data for the map come from the GEOS-5 forward processing model. Plenty of smoke and airborne particles have been measured near the ground, where it affects the air that people breathe. According to the National Weather Service in Seattle, the air quality in Washington state on August 15 was the worst in the country due to winds carrying smoke from surrounding fires. Atmospheric scientist Cliff Mass reported that in the Seattle area, the 24-hour average concentration of fine particles (PM 2.5) was the worst on record. The next day, an onshore wind flow helped push out the smoke and forecasters expected conditions to improve. Air quality that day also reached “unhealthy” levels across parts of Northern California, Oregon, Idaho, and Montana, according to the Environmental Protection Agency’s air quality index. Unhealthy levels indicate that everyone breathing the air could potentially feel adverse health effects. Meanwhile, vast plumes of smoke rose from more than 500 wildfires burning in British Columbia, prompting the provincial government to declare a state of emergency. 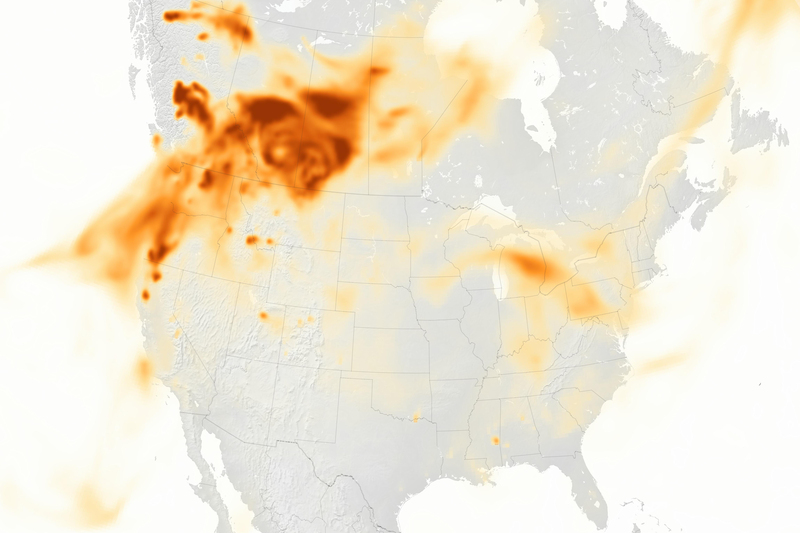 The thick plumes also yellowed the skies and degraded air quality in provinces to the east in Alberta, Saskatchewan, and Manitoba. The smoke from Canadian fires was so pronounced it was visible from a distance of about 1.5 million kilometers (1 million miles) away. That’s the distance of NASA’s Earth Polychromatic Imaging Camera (EPIC) on NOAA’s DSCOVR satellite, which acquired the second image on August 15. NASA Earth Observatory images by Lauren Dauphin, using VIIRS data from the Suomi National Polar-orbiting Partnership, GEOS-5 data from the Global Modeling and Assimilation Office at NASA GSFC, and data from DSCOVR EPIC. Story by Kathryn Hansen.